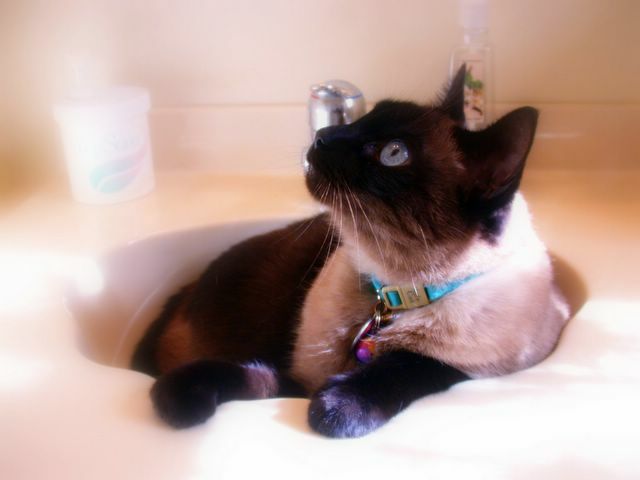 I don't know how much real "thinking" is going on in that walnut sized brain, but Mr. Rhett knows what he loves and he loves sitting, reclining, resting, contemplating and just plain sleeping in the sink. He stares at a spot on the wall, sometimes for a few seconds and other times for several minutes. I try to line my line of sight up with his; I'd like to know what he's is looking at. Is there a bug? A spot of sunlight dancing on the wall? No. No bug. No spot of light. Nothing unusual. Perhaps, as Victor Hugo said, he's in the midst of creation. I told Rhett he could go to see the other cats at Friday's Ark this week and those at the Carnival of the Cats hosted this week by Bloggin' Outloud. He wanted to know if Sophie was going to be there. I told him I didn't know. Then he wanted to know if they have a sink for him to sit in, but I didn't have an answer for that either. So many questions, Mr. Rhett. Just go. Visit. Explore.